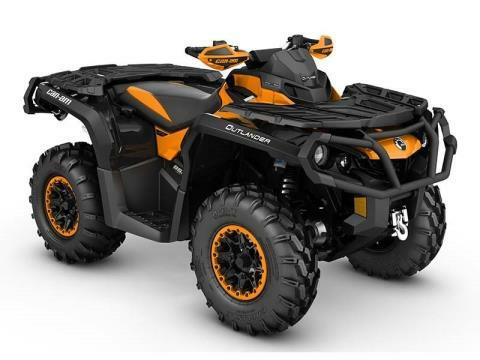 ROTAX V-TWIN ENGINE OPTIONS: Available with the new 78-hp Rotax 850 or 89-hp Rotax 1000R liquid-cooled V-Twin engine, with four valves per cylinder and single overhead camshafts, the signature Can-Am engine lineup offers unmatched power for a true performance edge. FOX PERFORMANCE SERIES 1.5 PODIUM RC2 SHOCKS: These high-performance front and rear FOX Performance Series 1.5 PODIUM RC2 shocks give riders the flexibility to fit all terrain and all riding styles, with easy dual-speed compression, rebound and preload adjustments. 12-IN. ALUMINUM BEADLOCK WHEELS WITH CARLISLE ACT TIRES: A mechanical fastening device makes it nearly impossible for the tire bead to break loose during heavy acceleration or cornering. The 26-in, 3-ply Carlisle ACT tires feature a tread pattern that is aggressive enough to tackle tough terrain, yet provide a smooth ride.